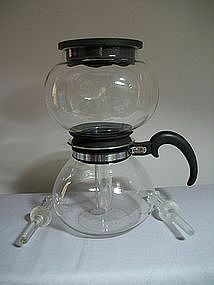 This is a very nice vacuum coffee pot from Westinghouse, glass made by Pyrex. It stands about 10 1/4" high. It comes with 2 Cory Filter Rods. The glass is in very good condition, there are some very minor scratches and there is some wear marks on the bottom, to be expected. The bakelite top lid does have a chip off the inside and 2 spots on the top outside. The rubber seal between the two pots is in remarkable condition given its age, still flexible with no signs of deterioration. I believe this model came with an electric base, wish I had it too!